Azerbaijan carpets are well-known all over the world for their quality and high artistic value. This carpet can become a wonderful investment for your house: it will serve for several centuries and not only will lose its colors and attractiveness. But it will become even more valuable and expansive. Carpets of Azerbaijan can be flat-weave and pile weave. The most popular type of flat-weave rugs produced now in Azerbaijan is called “Soumak” and “Kilim”. “Soumak” rugs made in the north of the country are more expensive than those which are produced in the south. Because they have a higher density. Carpets with a complicated pattern and delicate ornaments have high density. It has very large elements, the central field has very few details. So this rug has low artistic value and most probably low density. 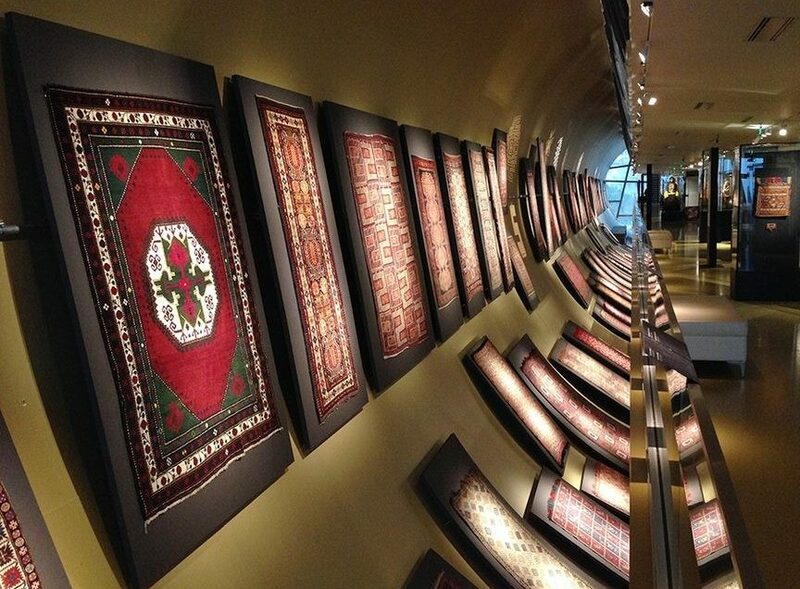 There are seven carpet producing regions in Azerbaijan: Baku, Shirvan, Quba, Tabriz, Qarabagh, Ganja, and Qazakh. Each region had its own technology, typical patterns, and colors. You can see these main colors in Azerbaijani carpets are red, blue, green, yellow and cream. Carpets which have a turquoise background. Every region has its popular color palettes and you can easily identify where the carpet is coming from. Azerbaijan carpets materials are mostly wool (lamb or sheep). There is only one silk producing in Sheki. 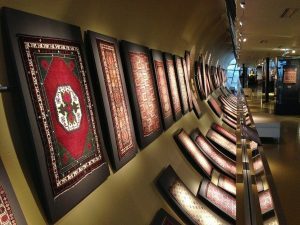 The amount of produced silk is very little, due to that reason the prices for a real silk carpet made in Azerbaijan are extremely high. Most of the shops in Baku sell Persian style silk carpets. And they are not Azerbaijan Production. It may be even China production (sometimes also hiding this information from buyers). Some of the carpets sold in Azerbaijan have the following effect: if you turn them upside down they will drastically change its color. The reason is that some carpet manufacturers wash the carpets with softeners and then iron them to achieve the smoothness of the pile. They can also tell that this is the effect of making carpet from baby sheep wool – bare in mind that this can be just a marketing trick. I haven’t seen the place in Azerbaijan where somebody will produce carpet made from “baby sheep wool”. This is one of the most important things to look at when buying a rug. The more density, the stronger the carpet, and the higher the price. Low density is from 25X25 knots per square decimeter. High density is 45X45 knots and higher. 60X60 knots is a very high density. High-density carpets were for Sultan’s palace. Nowadays it is very rare to find carpets of this quality. Have a look at the bottom side of the rug, you can easily calculate the knots: just put the ruler and measure square decimeter and then count the knots vertically and horizontally – this will be the density of the carpet. If the carpet is made properly and has a good density, there is no special care needed to maintain it: it is enough to vacuum clean it from time to time and your carpet will look like a new!